Be the first to share your favorite memory, photo or story of Italia. This memorial page is dedicated for family, friends and future generations to celebrate the life of their loved one. Italia S. DiMare was born on August 5, 1926 in Pozzuoli, Italy to Ernesto and Emilia (nee Barile) Carbone. She died Friday, March 15, 2019 in Libertyville. Mrs. DiMare worked in production at Zenith Electronics in Chicago. Italia enjoyed cooking, being with her family and traveling back to Italy. Italia is survived by her son, John (Nadine) DiMare; son-in-Law, John Cannizzo; grandchildren, Matthew DiMare (Elise), Jessica (Nathaniel) Niebert, Jonathan Cannizzo (Nicole), and Emily DiMare (Riley); niece, Mary Ellen (Robert) Munns and several other nieces and nephews. She was preceded in death by her husband, Vincenzo; daughter, Rosa Cannizzo; her parents and siblings. 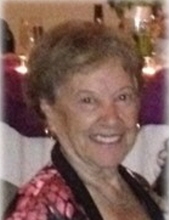 Visitation Monday, March 18, 2019 from 4:00 pm until 8:00 pm at Glueckert Funeral Home Ltd., 1520 North Arlington Heights Road (four blocks south of Palatine Road), Arlington Heights, IL 60004. Prayer Service 10:00 am, Tuesday, March 19, 2019 at Glueckert funeral home. Entombment will be at Elmwood Cemetery in River Grove. In lieu of flowers memorials may be given to Dementia Society of America, at dimentiasociety.org. "Email Address" would like to share the life celebration of Italia S. DiMare. Click on the "link" to go to share a favorite memory or leave a condolence message for the family.